What You Need From Your Catan Game To play Cities &Knights you will need most of the components from a copy of Catan. 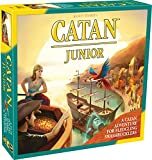 Set aside the following Catan pieces, as you won't need them: the development card deck, the "Largest Army" card; and the building costs cards. In Cities &Knights, these three card decks replace the development card deck from Catan. You need to attach 2 labels to each knight token. The front side of each token gets the "inactive" symbol (a black & white image), the reverse side of each token gets the "active" symbol (a full-color head). Important: Make sure to affix the correct stickers to each token. The "inactive" front and "active" back of each token must be a knight of matching level. For example, inactive basic on the front, active basic on the back, etc. Before playing your first game, you must separate the spiralbound pages of the development flip-charts. Each page of the flip-charts is perforated, so there are 3 parts to each page. Gently pull the sections of each page apart. When finished, you should have 5 pages, each divided into 3 separate sections. You use the development flip-charts to track the city improvements that you purchase. Each page of the flip-chart shows the building costs of each piece. Each section also shows the cost of the next level of improvement. When you buy a city improvement, you flip the page section matching the improvement you purchased. Each page section depicts an illustration of the improvements that you've purchased, and a number of red dice. These red dice tell you if you acquire progress cards. The third level of improvement in each category describes the special ability you've just earned for that development track. City walls are low, square wooden blocks that you can place beneath your cities. To build a city wall, you pay 2 brick resources to the bank. Each city wall you have on the board increases the maximum number of cards you can safely hold in your hand when a "7" is rolled on the production dice. Each city wall adds 2 cards to your "safe" hand limit. You may only build a city wall under a city. You can not place a city wall under a settlement. If one of your cities with a city wall is reduced to a settlement (by the barbarians), you must also remove that city wall from the board. Also, you may only build 1 city wall under a given city, and you can have a maximum of 3 city walls on the board at any given time. Normally, you play Cities &Knights on a random, variable game board, just like the Catan base game. However, we recommend that you use the prepared board set-up, it's ideal for your first game of Cities &Knights. This layout provides a balanced production of resources (most especially grain) and commodities that may prove scarce during the game. After constructing the frame, place the hexagonal tiles (hexes) within the frame as shown in the Game Overview. If you are constructing a random board, place the land hexes in the center of the framed area as you would normally. Next, place the "barbarian tile" as noted. The barbarian ship will move along this track toward Catan. Again, if using a random board, shuffle the harbor tokens and place them normally. Sort the resource cards into 5 stacks, 1 for each resource. Place them face-up near the island. Sort the new commodity cards into 3 stacks, one for each commodity. Place them face-up by the resource cards. Divide the progress cards into 3 stacks by the flag color on the back of each card (green, blue, and yellow). Shuffle each stack separately and place them face down near the island. Place the 3 metropolises, the trader cone, the 3 dice (1 yellow, 1 red, and 1 event die), and the "Longest Road" card near the island. Place the black wooden ship on the "barbarian ship" space on the Barbarian Tile. The barbarian ship moves along this track on its way to Catan. Place the robber on the desert hex. Once you've constructed the board and arranged the pieces, begin the set-up phase. Now the players place their initial settlements, cities, and roads. Each player rolls the dice; the player with the highest roll begins. Starting with the first player and continuing clockwise around the table, each player places 1 settlement and 1 road (as in basic Catan). Then, the second placement round begins with the last player to place a settlement. It continues counterclockwise around the table (so the first player to place a settlement will be the last to place). Each player now places 1 city and 1 road, following all of the normal rules for placement described in the Catan base game (i.e., no city may be placed fewer than 2 spaces away from all settlements, etc.). You receive your first resources immediately after you place your city. You get 1 resource for each terrain that your city is adjacent to. Place your development flipchart in front of you with the first page showing (indicating that you have not built any city improvements). You roll all 3 dice. The results of the event (symbol) die are resolved. Progress cards may be drawn (depending on the result of the event die). All players produce the resources indicated by the red and yellow dice. All players produce the commodities indicated by the red and yellow dice. Trade resources and/or commodities with the bank and/or other players. Build roads, settlements, cities, knights, city walls, and/or city improvements. Activate, promote, and/or perform actions with your knights. Play any number of progress cards. Note: The "Alchemist" progress card can only be played before the dice are rolled. It is the only progress card that can be used before the dice are rolled and the results resolved. First, use the event die to determine what event takes place that turn. If the ship symbol is showing, then move the barbarian ship 1 space closer to the island of Catan. The ship follows the track on the Barbarian Tile. The ship begins its journey on the space illustrated with the ship. The barbarians attack when the ship reaches the last space. If one of the three city gate symbols (blue, green, or yellow) is showing, then all players may be eligible to draw a progress card. To be eligible, a player must be able to match the number rolled on the red die with one of the red die icons showing on his flip-chart in the section that matches the color of the city gate rolled on the symbol die. Example: The event die shows a yellow gate, and the red die shows the number "1." All those players who have purchased at least the first level yellow city improvement (the market) are eligible to draw a yellow progress card. Beginning with the player whose turn it is, and continuing clockwise, each eligible player draws the topmost card from the progress card stack that matches the color of the city gate showing on the event die. Keep your progress cards secret from your opponents until you play them. You may never have more than 4 progress cards in your hand. Add the red and the yellow dice together to determine which hexes produce resources and commodities for all players. All hexes whose number matches this sum produces 1 of the appropriate resources for each settlement adjacent to it. Production for a city bordering a producing hex depends on the type of terrain rolled. As in Catan base game, any hex that is occupied by the robber does not produce any resources or commodities. Also, if a "7" is rolled on the dice, no hexes produce: instead, the player who rolled the "7" must move the robber and may be able to steal 1 card from any opponent whose settlement or city is adjacent to the robber. 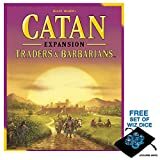 The robber cannot be moved until after the barbarians reach the island of Catan for the first time. Until the first barbarian attack, if you roll a "7", each player must check if he is holding too many cards as usual; however, you do not move the robber from the desert and you do not steal a card from another player. Further, you are not allowed to move the robber by playing of any progress cards (like the Bishop) or knight actions until after the first barbarian attack. In Cities &Knights, you are allowed to build and trade any number of times and in any order. You do not need to finish all of your trading before you begin your building. All of the rules from Catan apply to trades made in Cities &Knights (with the addition of the commodity cards). Progress cards may never be traded at any time. All of the basic rules for building remain in effect. The cost of roads, settlements, and cities remain unchanged. There are, however, 2 new items that you may elect to build during your turn. Also, you may no longer purchase development cards with resources. The 2 new items are city walls and knights. You may only build city walls under cities—never under settlements. You may only build one city wall under each city. You may never have more than 3 city walls at one time. Each city wall you control increases the maximum number of cards you safely hold in your hand when a "7" is rolled on the production dice. Each city wall adds 2 cards to this limit. Example: If you have 2 cities, each with a city wall, you may safely hold up to 11 cards in your hand without having to discard half of them when a "7" is rolled. If the barbarians pillage your city (i.e., reduce it to a settlement), the city wall is also destroyed. You must remove the city wall from the board. Knights are represented by the round wooden tokens. Each knight token is labeled on both sides. One side—showing the symbol of a knight's helmet in black and white—is the inactive side. An inactive knight may not perform any actions. The other side of the token, which depicts the helmet in color, is the active side. The type of helmet and the number of rings indicate the strength of the knight. Reminder: The open-face helmet and single ring denotes a "basic knight." The full helmet surrounded by a pair of rings indicates a "strong knight." The great-helm adorned with the glowing sun and trio of rings represents a "mighty knight". In order for a knight to take an action, he must first be activated. To activate a knight, you must pay one grain to the bank. Then you may turn the knight token over to the active side, which depicts the helmet in color. The strength of the knight does not affect the cost to activate it. It costs only one grain, regardless of whether it is a basic knight, or a mighty knight. A knight may be activated on the same turn he was built; however, the knight may not perform an action on that same turn. You can increase the strength and effectiveness of your knights by paying additional commodities. The cost to promote a basic knight to a strong knight or a strong knight to a mighty knight is one wool and one ore. When you promote a knight, return the old knight token (which may be repurchased later) and replace it with a token showing the next higher strength level. The new, stronger knight must be placed in the same location as the knight you have promoted. The status of the knight, active or inactive, is not changed when you promote the knight. You may promote a knight on the same turn that he was originally built, or on any later turn. A knight may only be promoted once per turn. You may only promote a strong knight to a mighty knight after you have purchased the third level of the politics (blue) city improvement (the "Fortress"). During your turn, after you have rolled the dice, you may play any number of progress cards in any order. You may play them between other actions taken during your turn. When you play a progress card, resolve all of its effects, then place it, face down, under the progress card stack of the matching color. In Cities &Knights, we've added 3 new, "refined" materials to the game. As in Catan, we refer to the 5 basic materials (lumber, wool, grain, brick, and ore) as "resources." Commodities are produced only by cities, and only in forest, pasture, and mountains. Commodities, when produced, are added to your hand of resource cards. They count toward the robber or limit when a "7" is rolled. They may be stolen by the robber, or lost as a discard. The borders on commodity cards are intertwined with ribbons that match the color of the commodity (gold for cloth, green for paper, and gray for coin). The borders on the resource cards all are plain knot work. Both commodity cards and resource cards have the same card backs (i.e., a map). Commodities may be traded in all the same ways as resources. You may trade them freely with other players. You may exchange 4 of the same commodity for 1 of any resource or commodity you choose. If you have a settlement or a city on a 3:1 harbor, you may trade 3 of any commodity for 1 of any resource or commodity of your choice. You may also trade 4 of any resource for 1 of any commodity you choose (3:1 at a harbor; 2:1 if you have the matching special harbor). You need commodities to acquire city improvements. Some progress cards specifically mention "resources" or "commodities." These cards can only affect the type of material they specifically mention. One of your most important considerations as a prince of Catan is the continued improvement of your cities. This improvement is made possible through the use of commodity cards. You are able to improve your cities in three areas of development: trade (yellow); politics (blue); and science (green). You may purchase improvements in all 3 areas even if you own only 1 city. Your city improvements are tracked with your development flip-chart. Your flip-chart is divided into 3 separate parts, 1 for each of the 3 areas of development. Each section has 5 pages, which correspond to the 5 levels of improvement you can acquire in each area. At the beginning of the game, open page 1 of your flip-chart; the page indicates that you have no improvements. The various improvements are represented by important buildings that can be constructed in your cities, such as a market, a cathedral, or a library. The cost of a building is shown in the lower right corner of each flip-chart page. Example: The market costs 1 cloth. Pay 1 cloth and flip the Market section of your development flip-chart. The first improvement in each area always costs 1 commodity of the matching type. The second improvement in each area costs 2 of that commodity. The cost of each subsequent improvement is again increased by 1. There is one restriction on the purchase of improvements, however. If you have no cities on the board (because the barbarians have pillaged your last city), you may not purchase any city improvements until you have built at least 1 city. Each improvement increases your chance of being eligible to draw progress cards. Each improvement shows a picture of the improvement. Above that picture is a row of red dice. Each die shows a number. If the event die roll shows a city gate, you may draw a progress card of like color—but only if the number on the red die matches one of the dice pictured on that color's section on your development flip-chart. A higher level of improvement increases your chance to draw progress cards. Example: If you have built the market improvement, it shows 2 red dice. If the event die rolls the yellow city gate, and the red die shows a "1" or "2," then you may draw a yellow progress card. Trading House (yellow): You may trade commodities (of the same type) 2:1 for any commodity or resource. You may make this trade only during your turn, as if you were using a harbor. This special trade advantage does not include resources, only the three commodities. Fortress (blue): You may promote strong knights to mighty knights after you have built the fortress. You must still pay to promote the knights normally. Aqueduct (green): If, when the dice are rolled for production, you do not receive any resources or commodities, you may take any one resource of your choice from the bank. You many not, however, use this ability when a "7" is rolled. Building city improvements is also important if you want to have a metropolis. A metropolis is represented by a yellow city gate. These gates are designed to fit over the wooden city pieces. Only 3 metropolises may be in play at any given time: one each for trade, politics, and science. The first player who achieves the fourth level of improvement in any one of these 3 areas (the bank, the cathedral, or the theater) may place one of the metropolis gates on any one of his cities on the board. You may take the metropolis only if no other player already controls the fourth level improvement of that color, for there can be only 1 metropolis for science, trade, or politics. When you acquire a metropolis, place the metropolis token of the appropriate color on your flip-chart to show which area is associated with your metropolis. A city with a metropolis is worth a total of 4 victory points! This includes 2 points for the city and 2 additional points for the metropolis. You may take another player's metropolis if you are able to acquire the fifth level of improvement in the matching color before he does. If another player reaches the fifth level of improvement before the metropolis owner does, he may take both the metropolis piece and the colored metropolis token. If you have reached the fifth level of improvement in any area, no player may take your metropolis away. A metropolis is immune to the barbarians. It can never be pillaged or reduced. However, the metropolis is counted when determining the strength of the barbarian army. You may build more than one metropolis. If you are the first player to reach the fourth level of improvement in more than one area (or if you reach the fifth level, thereby taking another player's metropolis away), you may place another metropolis gate on one of your cities. But, you may not purchase any improvements beyond the third level of a given color unless you have a city where you could build a metropolis. If you do not have such a city on the board, you must wait until you have built at least one more city. In Cities &Knights, progress cards replace the development cards from the Catan base game. You don't purchase progress cards like development cards; instead you draw them with the right combination of event die and red die. You must possess at least one level of city improvement in one or more areas of development. The first level of improvement displays two red dice, the second level displays three, and so on. The event die, when rolled on any player's turn, must show the city gate symbol whose color matches the color of one of your city improvements. The number on the red die, rolled at the same time, must match one of the red dice displayed on your city improvement whose color matches the city gate on the symbol die. If these three conditions are met, you may draw the top card from the progress card stack that matches the color of the city gate on the event die. If more than one player is allowed to draw on the same turn, then each player draws in turn order, beginning with the player whose turn it is. Example: Player A rolls a "6" on the white die, a "3" on the red die, and the yellow city gate on the event die. Player B has already built a town hall (blue) and a merchant guild (yellow). Since player B's yellow improvement shows a red die with "3", showing player B may draw a yellow progress card. Victory point cards must be played immediately when drawn. The Spy may not steal them, and they cannot be hidden in your hand. These cards do not count toward your hand limit of 4 cards. You may never hold more than four progress cards in your hand. If you draw a fifth progress card, and you cannot play it because it is not your turn, you must discard one card (of your choice) to the bottom of the appropriate stack. Progress cards may be played on the same turn they are drawn. Progress cards may not be traded with other players, nor may the robber steal them. When you play a progress card, place it face down under the appropriate progress card stack. Victory points, however, remain face-up and in play. Knights are essential for achieving victory in Cities &Knights of Catan. Without them, the barbarians will surely pillage your cities and ruin your hopes for victory. Like settlements, knights are placed at the intersection of three hexes. However, knights do not have to observe the distance rule. Knights can be placed to block construction of other players, and they can also be used to break another player's "longest road". Example: A knight placed at the intersection of two players' roads will keep the opposing colored player from building past the knight. The red player has four available intersections for knight placement (marked with arrows). If the red player places a knight at intersection "A," the blue player will not be able to build past that knight. Only the red player can build a road there. If the red player places his knight at "B," it will break blue's road, shortening his road for purposes of determining the longest road. There are 3 strengths of knights: basic knights, strong knights, and mighty knights. A basic knight has a strength of 1, a strong knight has a strength of 2, and a mighty knight has a strength of 3. Knights serve you in 2 ways. First, they help protect Catan from the barbarian army. Second, your active knights can perform one action during your turn. Each knight may perform any 1 of the actions each turn. A knight may not be activated and then perform an action on the same turn. A knight can, however, perform an action and then be activated again later on the same turn (although he cannot perform another action on the same turn). When a knight performs an action, the knight token is turned over to the inactive side. To activate that knight again, you must pay one grain. You may move an active knight to another intersection. In order for the knight to move, you must have built roads linking the intersection the knight is moving from to the intersection that he is moving to. An intersection may only be occupied by one knight at a time. However, a moving knight may pass through any number of intersections that are occupied by pieces of the same color (assuming that they are all connected by roads, as above). After you have moved the knight, he becomes inactive. If you wish to build a settlement on an intersection occupied by one of your knights, then you must first move the knight. If there is no empty intersection for you to move your knight to, then he may not move and you may not build at that intersection. Example: The red player may elect to move his active knight at intersection "A" to either intersection marked with an arrow. The knight may not be moved to "B" or "C," as red does not have roads connecting these intersections to "A". On your turn, you may move one of your active knights to an intersection that is occupied by one of your opponent's knights. This is called "displacing" a knight. You may only displace a knight if he is weaker than the knight that you are moving. Thus, a strong knight can only displace a basic knight, and a mighty knight may displace a basic or a strong knight. A basic knight may never displace another knight. The owner of the displaced knight must move his knight to any empty intersection that is connected, by roads, to the place from which he was displaced. The status of the displaced knight (active or inactive) does not change. If there is no empty intersection for the displaced knight to move to, he is removed from the board. You may not displace your own knights. After you displace an opponent's knight, move your (displacing) knight to the displaced knight's former intersection. Your knight is then turned over to his inactive side. Example: The red player is at it again! He moves his strong knight to the intersection indicated by the red arrow. He may do this because his knight is stronger than the blue (basic) knight (note the number of rings), and he has a road that connects the two intersections. The blue player must now move his displaced knight to "A" or "B," which are both connected to his original site by roads. He moves to "B." Note that "C" is not a connected site, so he cannot move to that spot. You may use one of your active knights to chase away the robber. Any knight may do so, regardless of his strength. A knight may only chase away a robber if the robber is on one of the three hexes adjacent to that knight. When you chase away the robber, move him to any numbered hex and steal one resource from any player who has a settlement or city adjacent to that hex (as if you had played a knight card from the Catan base game development deck). After you chase away the robber, your knight is turned over to his inactive side. Example: The red player's knight can only chase away the robber from the gray hexes. In order for the red player to chase away the robber, he must first move his knight to intersection "A" or "B" (which makes him inactive). Then he must pay one grain to activate his knight. On a future turn, he could then use his knight to chase away the robber. Catan is in constant danger of attack from the barbarians that live across the sea. Each turn the event die shows a black ship, the barbarian navy moves one space closer towards Catan. When the ship reaches the red-circled space that depicts barbarians landing on the shore, the barbarians attack Catan! The strength of the barbarians is equal to the number of cities (including metropolises) owned by all players. Add up all of the cities owned by all of the players anywhere on the island to determine this strength. All active knights of all players (even those who do not own any cities) will defend against the barbarians. Only the active knights are counted, the inactive knights do not assist in defending the island in any way. Remember that the strength of each knight is based upon its type: basic (1), strong (2), or mighty (3). Sum up the value of all the active knights to determine the strength of the defending army. If the barbarians are stronger, they are victorious! If the barbarians win the battle, they pillage one or more cities. Pillaged cities are reduced to settlements (replace the city piece with a settlement). The barbarians pillage one city belonging to the player who had the lowest total strength of active knights when the barbarians attacked. Any player who contributed no knights are automatically considered to have the lowest total strength of active knights. If various players tie for having the lowest total strength of active knights, each of those players loses 1 of his cities. Important: When determining which player has contributed the weakest group of knights, do not count any player who has no cities or any player who has only metropolises. These players are immune to the effects of the barbarian attack. If the barbarians pillage a city that has a city wall, the city wall is destroyed and removed from the board. Example: Players A and B each have two cities. Player C has only a metropolis, and player D has only settlements. The barbarians attack, and their strength is 5 (i.e., 4 cities plus 1 metropolis). Players A, B, and D each have one simple knight activated, and player C has no active knights. Therefore, the knights defend with a strength of 3. Since the knights are weaker, the barbarians win and Catan loses. Because of the loss, players A and B each lose one of their cities. Player C cannot lose anything because he has only a metropolis. Similarly, player D has no cities to lose. Even though C contributed fewer knights than all the other players, since he is immune to the attack it is the next smallest contributor who thus suffers the effects of the barbarians. If the knights have a strength equal to or greater than the barbarians, the knights win and Catan is saved! The player with the highest total strength of active knights (this will not always be the greatest number of knights) will be declared the "Defender of Catan"! As a reward, he is presented with one of the 6 "Defender of Catan" victory point (VP) cards. Each VP card is worth 1 VP and is placed face-up in front of the player. If 2 or more players tie for the highest total strength of knights, no player is declared Defender of Catan, and no one receives a VP card. Instead, each of the players who tie for the highest strength draws the top card from any 1 of the 3 progress card stacks (his choice). In clockwise order, each eligible player selects 1 card, starting with the player whose turn it is. Regardless of the outcome of the attack, the barbarian ship is returned to its starting position. All knights on the board are turned so that their inactive (black &white) side faces up. Starting with the next player's turn, the barbarians will begin a new journey to the rich island of Catan. If you are unfortunate enough to have your last city pillaged by the barbarians, you are allowed to keep any city improvements that you may have built before the attack. You also keep all of your progress cards. You may continue to draw and play progress cards normally. Note, however, that you may not build any additional city improvements until you have built at least one city. Once you own a city again, you may continue to purchase city improvements normally. The merchant piece (the cone) is put into play whenever any player uses one of the "Merchant" progress cards (from the yellow stack). If you play one of these cards, you may place the merchant piece on any land hex adjacent to one of your cities or settlements. Until another merchant card is played, you may trade the resource (not commodity) that is produced in that land hex at a 2:1 rate. All of the normal rules for trading at a 2:1 harbor are in effect for these trades. Note: In addition, as long as you retain control of the merchant, you receive 1 victory point! If another merchant card is played, whoever played that card (it could be you) takes control of the merchant. He may move the Merchant to any hex adjacent to one of his settlements or cities. He receives the trade benefit, and he gets the bonus victory point. The first player to accumulate 13 or more victory points during his turn immediately wins the game. This player becomes the "Lord of All Catan" and receives the endless praise and love of all the people of Catan! Check here more information about the Cities and Knights expansion. Read here The Cities & Knights of Catan strategy Guide.